If I had to pick a product update that mattered the most in 2017, it would be our new SDKs. In October, we announced our biggest update so far: server-side SDK 4.0 Beta for Python, Ruby, Node.js, PHP, Go, .NET & Java. On the client side, we announced Browser SDK 2.0, the next version of our SDK for applications to integrate Voice calling in the browser. With this update, you can now have visibility into call quality metrics, gather real-time user feedback and have better flexibility to reduce CPU utilization, improve QoS and configure the application based on user needs. We are on a mission to make the Developer’s life easier. In November 2017, we announced a completely revamped Developer Portal with brand new use cases, API references & documentation. Achieving Developer delight is a continuous journey, and we will continue to listen and make things faster, easier and more engaging for you. On the integration front, we started out with Integromat. The Plivo-Integromat integration would let you use Plivo’s capabilities in your Integromat scenarios to the fullest extent possible. Just after that, we announced the integration of Plivo Connector for Microsoft Flow. With this connector, you can now integrate Plivo with 200+ connectors including the Office and Azure product suites. We wrapped up our integrations for the year with the launch of Plivo app for Zapier. You can now do so much more with Plivo by connecting it to the other apps you use like Slack, Gmail, and Google Sheets (and other 750+ apps on Zapier) to automate the tedious tasks in your workflow. Our focus on voice quality improvement got a big boost with the announcement of OPUS codec support for our Browser SDK which pretty much means world’s most advanced audio optimization with reduced jitter, lower latency & better packet loss. What does it mean for your business? Well, now with Plivo, you can be assured that you are getting the BEST quality on your voice calls that’s technically possible today. At Plivo, we are a big believer in customer intimacy. Our high-touch customer engagement model is something that has helped us stay connected with our clients. So, while adding customers & partners, we also continued expanding our team in key areas like engineering, support & customer success. We are now 140+ strong and currently hiring more. Bigger teams need bigger homes! This year, we moved into a brand new office in the heart of San Francisco on Mission street. The area is bubbling with creative & passionate people from the coolest startups, coffee shops and more. Speaking of cool places! We announced our 3rd global office in Dublin, Ireland which is fast becoming Europe’s start-up hub. In our business, our direct carrier network connectivity has been one of our unique differentiators. 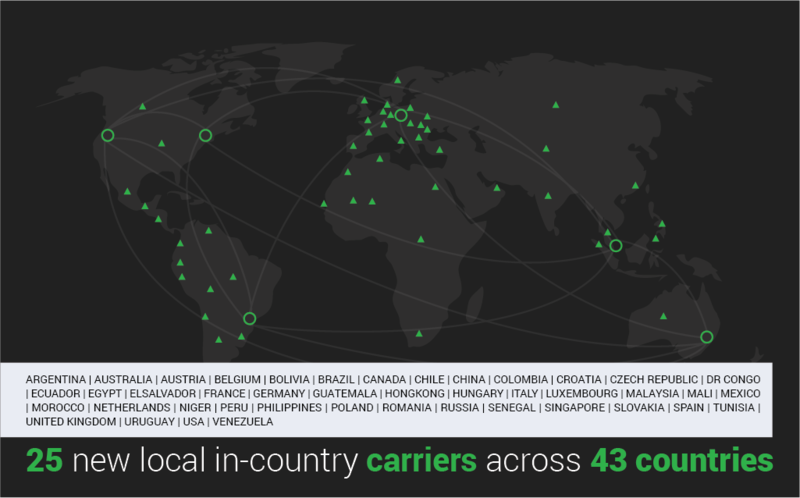 This year we further strengthened it by expanding our carrier base to add 25 new in-country carriers across 43 countries. 2017 was also a year of infrastructure scale-up for us. As we scaled the business, we invested significant effort and resources on our infrastructure which led to improved reliability and ensured an SLA of over 99.95% uptime for your business in the last 180 days. Our average response time per customer query came down by 50% with investments in people, processes and tools. Improving reliability and predictability of the platform of is a continuous journey, and we will continue our investments in 2018 as well. If 2017 was interesting, I can promise you that 2018 will be nothing short of spectacular! Design, innovation, ease-of-use, and reliability will be central to everything that we do this year. We will continue to listen to you, be personal in our approach and reach out to you more often with our updates - big or small. Stay tuned! If you plan to be at Enterprise Connect Orlando this March - Do remember to drop in at Booth No. 218! Mail us at enterpriseconnect2018@plivo.com to set up a meeting. We continue to hire in 2018. Check out our Job Openings for details.